Exchanging and understanding scientific data and their context represents a significant barrier to advancing research, especially with respect to information siloing. Maintaining information provenance and providing data curation and quality control help overcome common concerns and barriers to the effective sharing of scientific data. 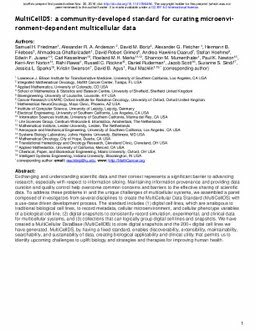 To address these problems in and the unique challenges of multicellular systems, we assembled a panel composed of investigators from several disciplines to create the MultiCellular Data Standard (MultiCellDS) with a use-case driven development process. The standard includes (1) digital cell lines, which are analogous to traditional biological cell lines, to record metadata, cellular microenvironment, and cellular phenotype variables of a biological cell line, (2) digital snapshots to consistently record simulation, experimental, and clinical data for multicellular systems, and (3) collections that can logically group digital cell lines and snapshots. We have created a MultiCellular DataBase (MultiCellDB) to store digital snapshots and the 200+ digital cell lines we have generated. MultiCellDS, by having a fixed standard, enables discoverability, extensibility, maintainability, searchability, and sustainability of data, creating biological applicability and clinical utility that permits us to identify upcoming challenges to uplift biology and strategies and therapies for improving human health. Friedman, S.H. (Samual), Anderson, A.R.A. (Alexander), Bortz, D.M. (David), Fletcher, A.G. (Alexander, Frieboes, H.B. (Herman), Ghaffarizadeh, A. (Ahmadreza ), … Macklin, P. (Paul). (2016). MultiCellDS: a community-developed standard for curating microenvironment-dependent multicellular data. bioRxiv.